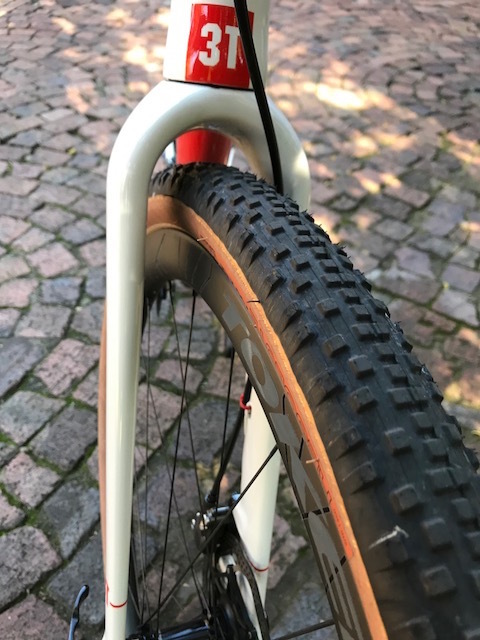 The 3T Exploro is an Aero Gravel bike. There is nothing quite like it and the dynamics of the bike make it fast on or off road with or without knobbly tyres! Nic White had the chance to test the bike over the past few weeks. 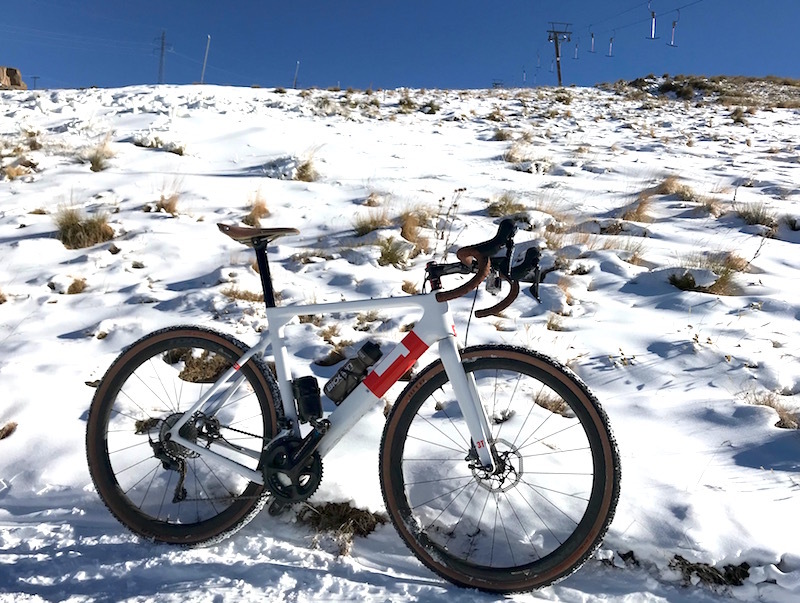 "I have had the chance to ride the 3T Exploro over a variety of terrain over the past few weeks. Starting off with a bike trip through the Lesotho Mountains which encompasses some of the highest altitude roads in Southern Africa. I had the chance to ride up the gravel road of Sani Pass, with gradients of up to 19%, combined with the thin air of 2800m above sea level. 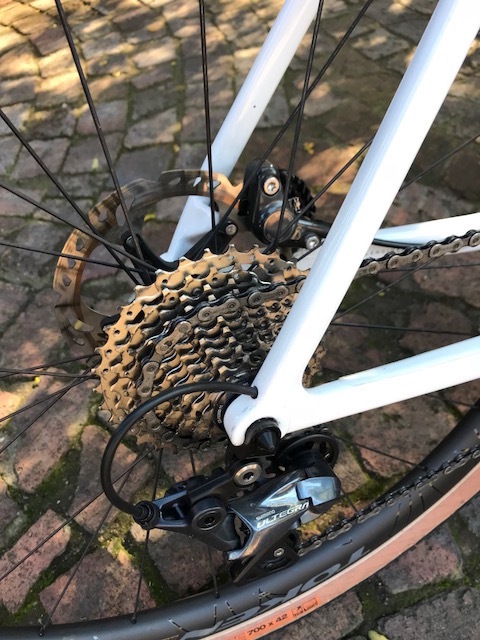 I specced the 3T Exploro with Shimano Ultegra, alowing the lightest gear to be a 34t front inner ring, and on the rear 34t gear. This was a bit of a challenge to scale the heights on loose surface with little air, but nevertheless a great challenge! As pictured with my chosen buildset, Shimano Ultegra mechanical groupset, Hydraulic disc brakeset with 700c Token Ventous C36 disc wheelset, and WTB knobbly 42mm tyres. 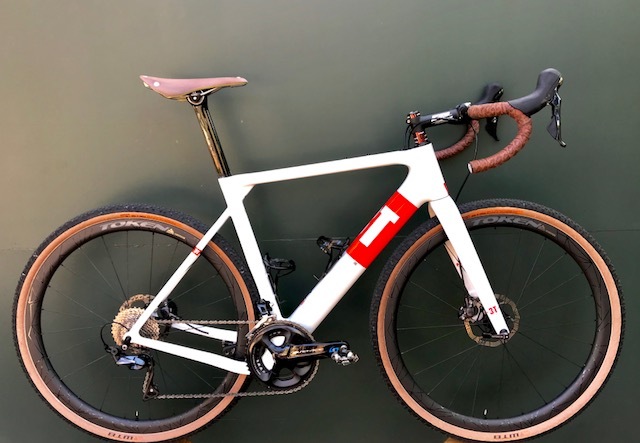 The 3T Exploro complete bike comes with a standard spec with a 1 x 11t SRAM drivechain and 650b wheels, in three different levels of components, but you can purchase the frame set alone as well. This bike performed exceedingly well on the rougher terrain. Soaking the vibrations and bumps with ease. Tyre pressure was essesntial for good handing on the dirt, and we did play around with that pressure, softer on Gravel, and harder on tar. One of the most exciting attributes of this bike is the aero shaped tubing which they have named 'SqAero'. Some might think it is a bit of a gimmic, but this proven tube shape has been used in many bikes designs in the past. Now placed on a gravel specific bike, with wide tyres, has alowed for greater aerodynics and speed. The bike flew down the hills with little promting, and not too much pedaling. The faster it went the faster it wanted to go. All cables are hidden, entering the frame behind the head set, keeping it neat, and when built well, there is no rattling of the cables. (Sprocket & Jack built the bike up) The frame has space to lower the down tube bottle cage if running 1 bottle option for greater aerodynamics, as well as space along the top tube to bolt on a bento box for my Biogen ride snacks. 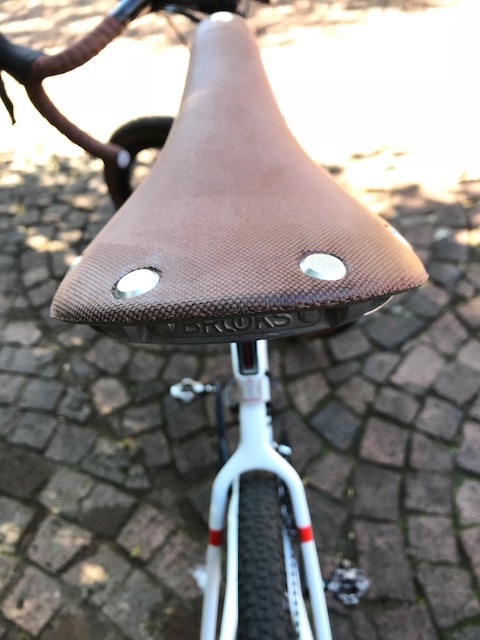 I added a Brooks Cambium saddle to my bike, perhaps not the lightest, but I have enjoyed the flexibility of the gum saddle with canvas all weather covering. Talking of the variability of the wheels for this bike. I have the option to ride with a traditional 700c wheel, which alows for wider tyres than the traditional cycloross bikes, so a 45mm knobbly tyre can fit. 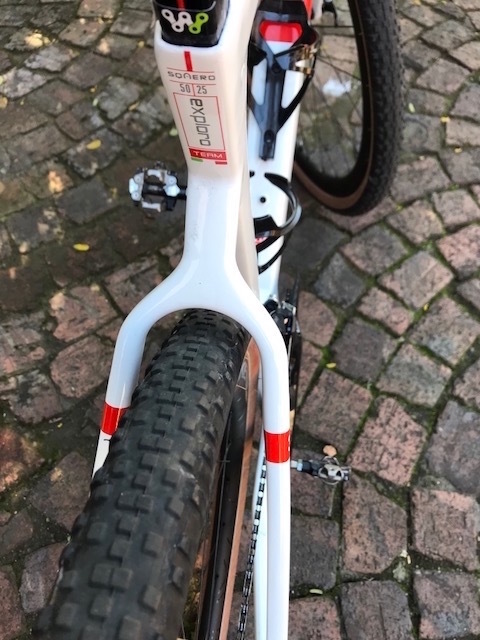 The second most important attribute of the frame is that you can use a 650b wheel set with mountain bike sized tyres up to 27,5 x 2.2. I have yet to try the 650b wheelset, but for rough terrain, this is said to be a far more comfortable ride, while the bigger tyre size has an outer circumference that is the same as a thinner 700c wheel and tyre, so the bike will still handle in a similar fashion, but will be capable of managing far rougher terrain! I have also ridden the bike with 28c road tyres. It was just as competent as a road bike, nimble, fast and definately capable of keeping up with the road groups. A view of the clearance of the rear tyre, 42mm width with knobblies. It was rather close to the seat tube though, but ample room around the rear stays and seat stays. The cassette, 11/34t shimano 11 speed, with the rear deraileur that has a loose derailer hanger. When taking off the 12 mm though axle, the derailer on it's hanger is loose. I am not so sure I like this design, but can live with it, and it goes back on easily enough, while the gears stay aligned. My choice of saddle, Brooks cambium C15. Comfortable and a bit of extra give for the bumpy roads. 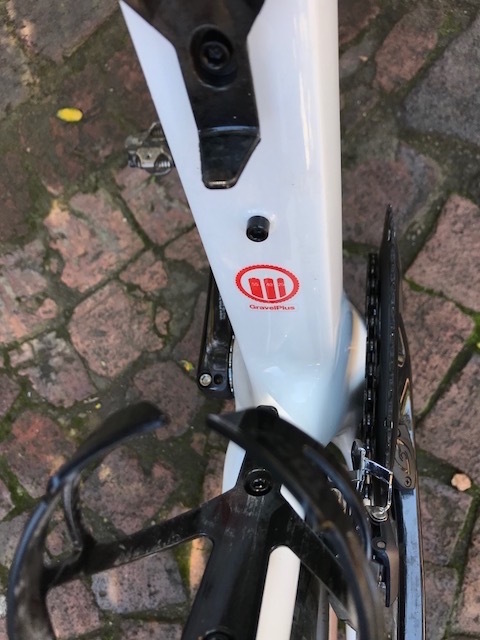 A view of the tyre options the bike can handle, as well as the bolt for the lower bottle cage mount if you are using bike bags for unassisted travel. A bike for all occations, eaqually at home on rough terrain as it is is at high speeds on the pavement!"